Baby Growth Development and Height. What's tall, average and short in an infant, anyway? Zoom in on a baby growth chart to see where your baby's length falls. Use your browser's view button, and scroll to zoom. These charts are simplified and feature the taller percentages. 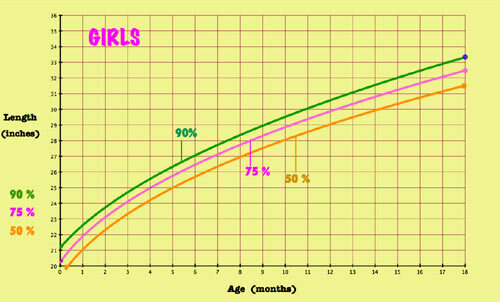 The chart shows length as compared to other babies the same age. This baby growth chart will tell you a lot about the relative measurements that will hold true for your child during the time frame that they're still a baby. Check back at various baby development stages to see if you're still talking about a relatively tall infant. If your baby falls above the 75% line, and especially above the 90%, you've definitely got a longer-than-average bundle of joy. You also get these measurements at regular infant check-ups with your pediatrician. If a term like, "85th percentile" is Greek to you, all it means is that your baby is measuring beyond 85% of others. So, if he's at the 85th percentile (85%) for length on a baby growth chart, he is taller than 85% of other babies the same age. The same translation applies for whatever figures he has in weight, head circumference, etc. He may be in the 90th percentile for height, the 60th percentile for weight, and the 50th percentile for head circumference. That would be a long height, a slightly higher than average weight, and at the mid-point for head size. This basically adds up to simply a long and lean, or a tall baby! Measurements at birth don't necessarily stick in relative terms. But by the time your baby is a few weeks old, the trends in his measurements are pretty consistent. A really long baby at 6 weeks is probably going to be a pretty long baby at 5 months. in fact, baby development 3 months is a pretty good midpoint. If they're long then, it's likely they'll be long for the rest of the year at least. A 4-month old in the 95th percentile for height, can be the length of an average 9-month old! A 5-month old exceeding the 95th percentile can be the length of a 1-year old. That's why one-size-fits-all products, don't really "fit all". So does the baby growth chart say he's headed for the NBA or her to the NWBL? Predicting adult height is a real guessing game. Fortunately with babies, we're not talking here about making huge predictions, we're talking about how your baby already measures. Longer, taller babies can tip and wiggle themselves out of gear which average sized babies cannot. Baby development stages don't always work like they say on the box. You'll notice many products that say, suitable from a minimum age X months, to a maximum of Y pounds! The problem is, a tall baby can be at the maximum weight, by the minimum start date. If you take a big picture view, baby products are designed for the middle ranges and the averages. About the only difference for boys and girls are the color schemes. This means that the swing, bouncer or activity center you buy, may also be purchased by the parents of a 17 inch baby, and yours was born at 22. That's a 5 inch difference, or nearly 30%. In adult terms, it's like someone 4 foot 10 buying a 6 foot tall person's bicycle. This is why a baby growth chart is of interest when you're buying products designed for the "middle". To look at it another way, a 4 month old baby can be 21 inches long. A really tall 4 month old, can be 30 inches long. Put them in the same exersaucer and they're not just uncomfortable, the taller baby can have sharp toys at eye level. 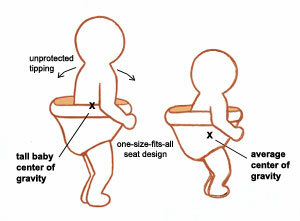 Longer babies don't just extend beyond the product parameters, they have a higher center of gravity in activity seats. Before 6 months old or so, they don't have tummy muscle control to sit on their own. This means they can "tip" out or over the seats! See the illustrations for a little clarification. And that's just one example of a baby stuff problem. So we've scoured the baby gear world for stuff that fits better. What are the odds we'll have a tall baby? To predict your yet-to-be-born baby's height, you may already have measurements from 3-D ultrasounds, and results stating its in-utero percentiles for length. Even if not, the fact is, taller parents on average, produce taller babies. It's not absolute, but it's "going with the odds." So, what percentile do mom and dad fit in? 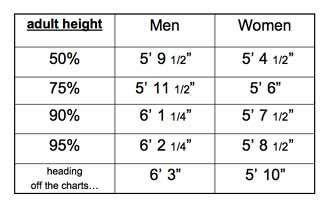 If you're not ready for the baby growth chart, check the adult growth table for some basics to help predict. These stats surprised us, if only because of the huge number of personal acquaintances that seem to be over the 90% mark. At least where we live, loads of adults appear taller than average, and we didn't know 5'10 could put a woman nearly off the charts (97% and up) in terms of percentiles. What do you suppose that means if you're a woman over 5'9? or a man over 6'2? 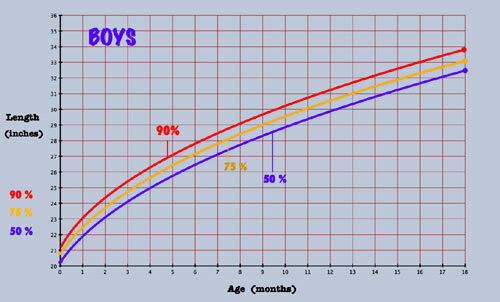 If your baby just stays relatively "on par" with you, he or she would be well at or above the 95th percentile! And above the 90th if you're 5' 7 1/2' and 6' 1". The odds are simply that you'll have a long baby. This baby growth is not absolute, but it's very likely. See where yours lands on the baby growth chart and compare your own percentiles. What if one parent is REALLY tall, and the other, not so much? Who know what your baby growth development will be. But with height tending to increase with generations, we say, keep those receipts for taking things back. Or just buy the stuff online after birth and have it shipped to your door just in case!